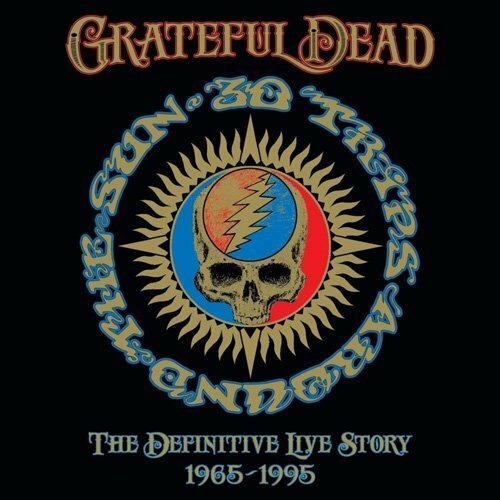 Today, the Grateful Dead have released an 80 CD box set titled 30 Trips Around the Sun: The Definitive Years (1965-1995). The massive collection spans over 73 hours of music from the dead's 30 year career, and includes one previously unreleased live concert from each year. The 4½ hour abridged collection, which you can stream above, includes one song from each of those concerts. Also included is a 7″ vinyl containing a studio version of "Caution (Do Not Stop on Tracks)" from their earliest recording sessions in 1965 and "Box Of Rain" from their last show in 1995. Tracks we recommend: ALL OF THEM! The 80 CD set is available on Dead.net. For those who prefer not to shell out the $700 asking price, a four CD set is available on Amazon (CD, MP3). You can also stream the abridged collection above for free, via Spotify. In other exciting Grateful Dead news, members of the band have 2015 tour dates coming up in Phil & Friends and Dead & Company. For the latest music and news on the Grateful Dead, check out their Zumic artist page.